Evidently June is Carrot Month in Walsh Cooks world. 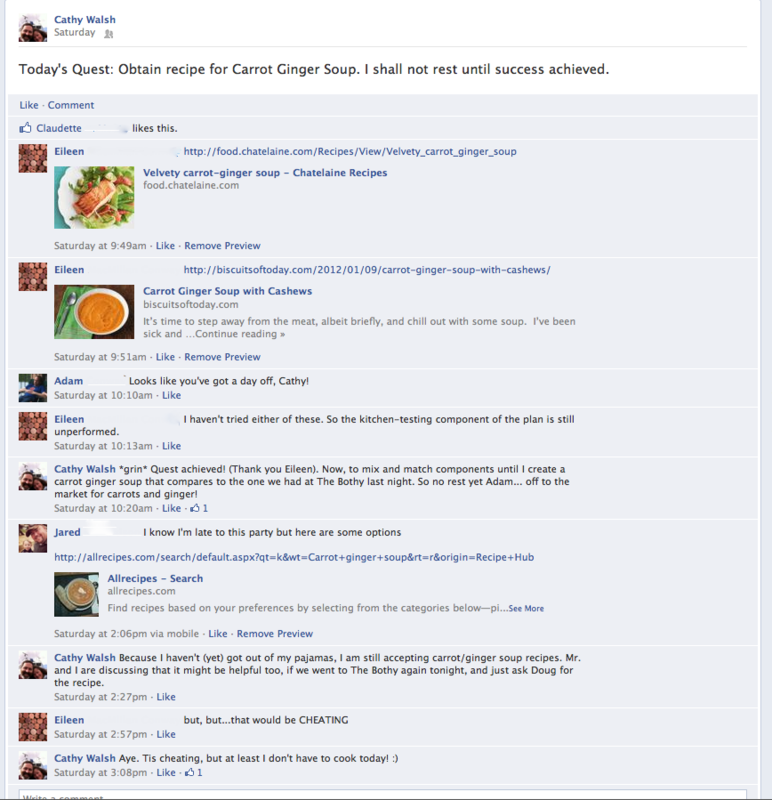 Remember, one year ago I had my epic failure at Pickled Carrots – My Way. “Try try again” I will say to anyone who will listen, so I am taking my own advice, dusting myself off and carrying on. Looks like pickled carrots – but don’t be fooled. These tasted like orange coloured wooden sticks swimming in a watery bath of vinegar. FAIL. Last Friday I was out with a friend at The Bothy, and after a lot of chatter we finally found ourselves choosing supper. The Soup for the day was announced as Carrot Ginger. I was game to stray from my usual favourite and menu fixture, Tomato Bacon and try something new. 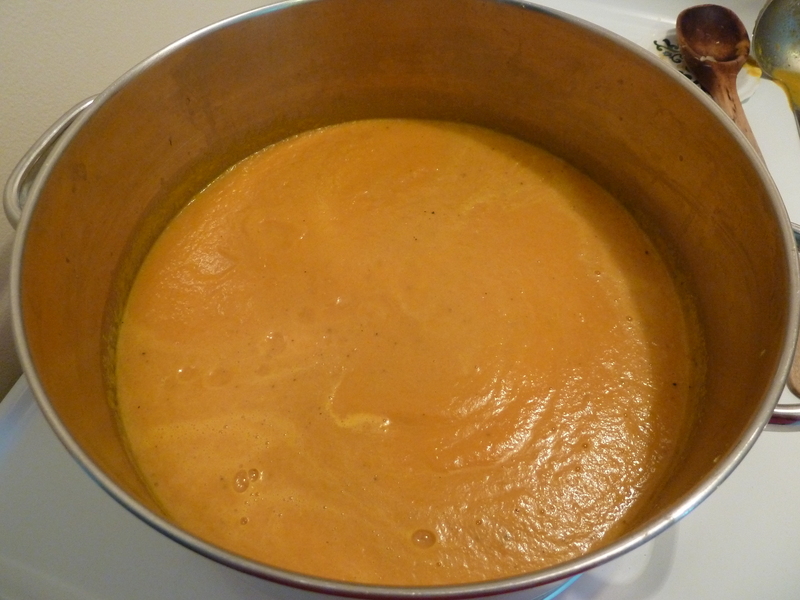 It was so delicious, the next morning I was on a quest for a recipe for Carrot Ginger soup. I posed the question on Facebook, and with the lovely friends and relatives that I have, I received a plethora of recipes. Some tried and true favourites, others the result of a Google search, etc. etc. I reviewed each of these recipes with care, and also drew on my memory of the night before and tried to recall some of the key flavours…. carrots, check. Ginger, check. But then, some of the recipes I was sent, had… butternut squash… hm… nutmeg.. no no nutmeg at The Bothy. Garlic? I don’t remember garlic! Thicken with potato. Potato? Was it a white or yellow onion? And just like a memory flashback montage in a 1970’s movie, I had images of garlic, butternut squash, nutmeg and onions swimming around in my head. Best solution? Go back to The Bothy and ask for the recipe. INTERRUPTION: If I’m getting too verbose, you can stop here. My soup is done, and I’m happily eating a bowl of it right this minute. Splatters of orange on the keyboard as proof. If you remember last Saturday, June 23, it was a beautiful sunny afternoon and it required absolutely no effort to get Michael interested in an afternoon on a sunny patio. 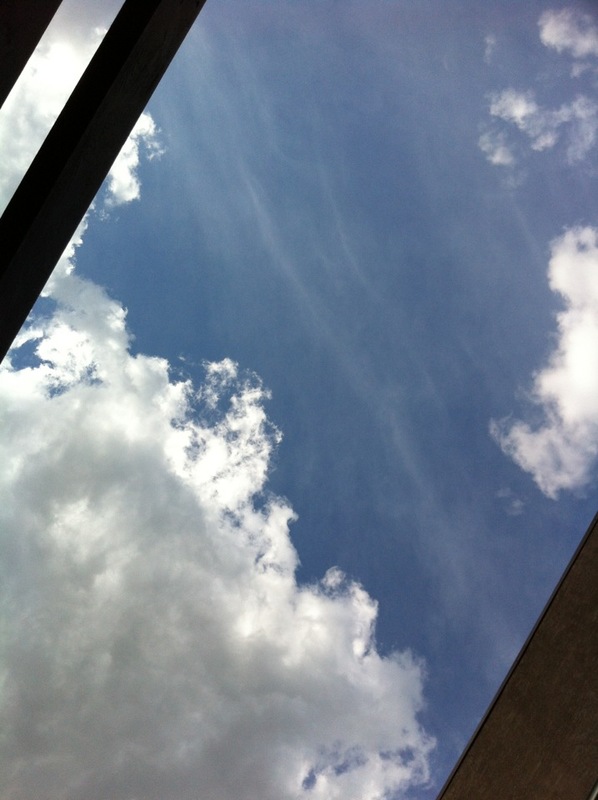 Blue sky, fluffy white clouds, no mosquitoes. Perfect day. 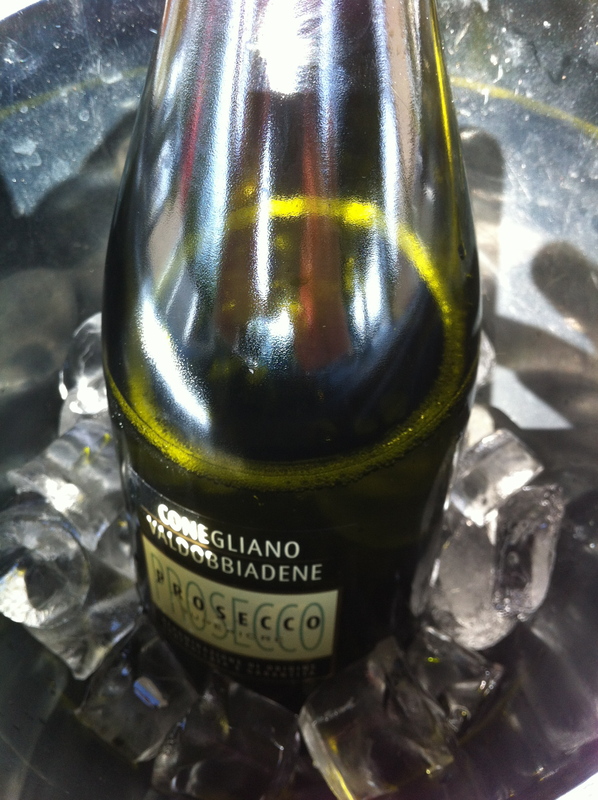 Icy cold Prosecco. Perfect on a hot summer day. How I do it. Serve yourself. Bowls are in the cupboard, spoons in the drawer. Use the ladle! Cream is in the fridge. I asked for the recipe, and Ray-the-Bothy’s-chef came out an talked to us. He’s a decent sort of person, and was happy to share the ingredients along with some tips. I’ll share with you because I believe in sharing (except my daily allotment of milk chocolate that I have with my late-night tea. Touch that and you risk harm). “Wash, don’t peel your carrots” says my new friend Ray. “All the nutrients are in the skin”. Peel that away and you might as well be eating white bread. (That last sentence was my own. Ray did not say that). “Scrape your ginger with a spoon. This way you don’t waste valuable ginger when peeling it off with a knife”. OK Ray, got that part, but no where, I mean NO WHERE have I read how miserable a task it is to grate ginger. I pulled out my trusty box grater, used the second smallest hole, and ended up with a pool of ginger juice and a few bits of ginger stuck to the grater. Nothing else. I stood there for a few seconds saying, “WTF?”. I girded my loins. I used the cheese-grating side of my box grater, and ended up with a pile of ginger string. Now what? If you were invited over for supper, I’d strain the soup. But in my Test Bowl, I did have a few strings of ginger. Sounds appealing to kids though! I could easily sub-title that, “Watch Grandma pretend she’s a cat with a hair ball!”. The strings of ginger are just that – stringy. But easily enough removed. Any tips you might have about how to effectively grate ginger will be appreciated. The great thing about soup is you don’t have to fuss with chopping your veg. Rough chop is fine. Toss the lot of vegetables in your pot and saute for about 15 minutes. Add salt, pepper, chicken stock. Simmer for as long as you have. Blend until velvety smooth. Ladle a generous amount in your favourite soup bowl, add a bit of cream. Eat. There you have it. 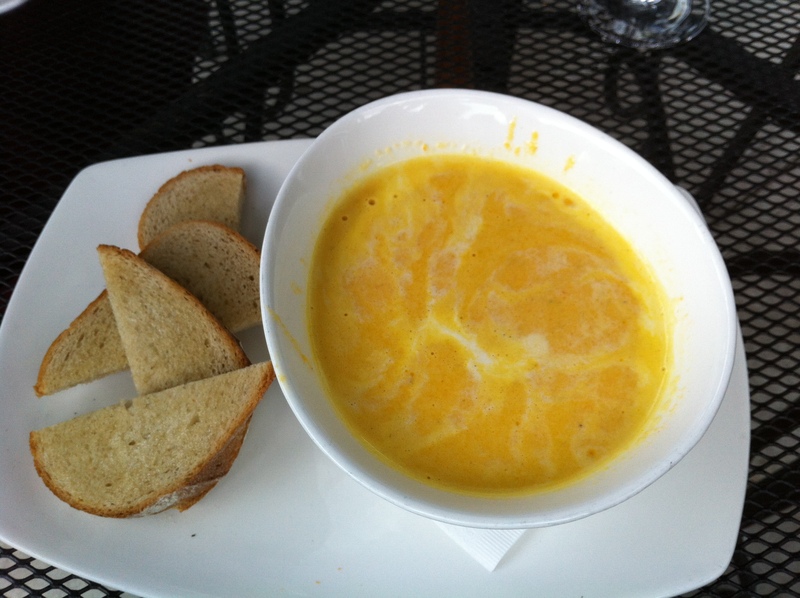 Carrot Ginger soup. Enjoy! lovely soup! 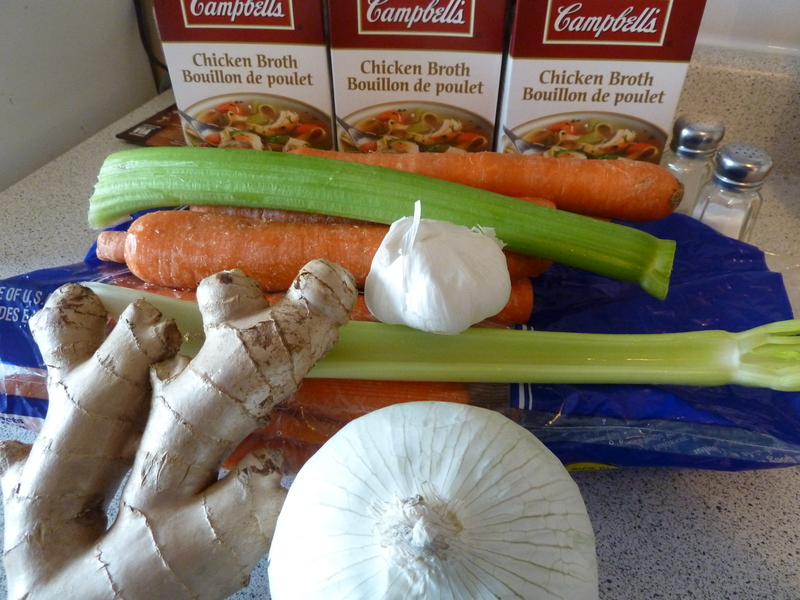 i am not much of a cook, but must say that my soup, (especially my carrot ginger), rocks! i used to just kind of steep the ginger and then fish out the chunks till i discovered THE SECRET! the bits are small enuf that no one will feel like they have a hairball! I am just thinking one could save one’s knuckles, perhaps, by putting small chunks of frozen ginger into the Mouli grater (that’s the kind they used in restaurants to crank out fresh parmesan on your dinner)…and grate it that way? I have a yam and ginger soup I love this much. Laughed myself silly, as always. 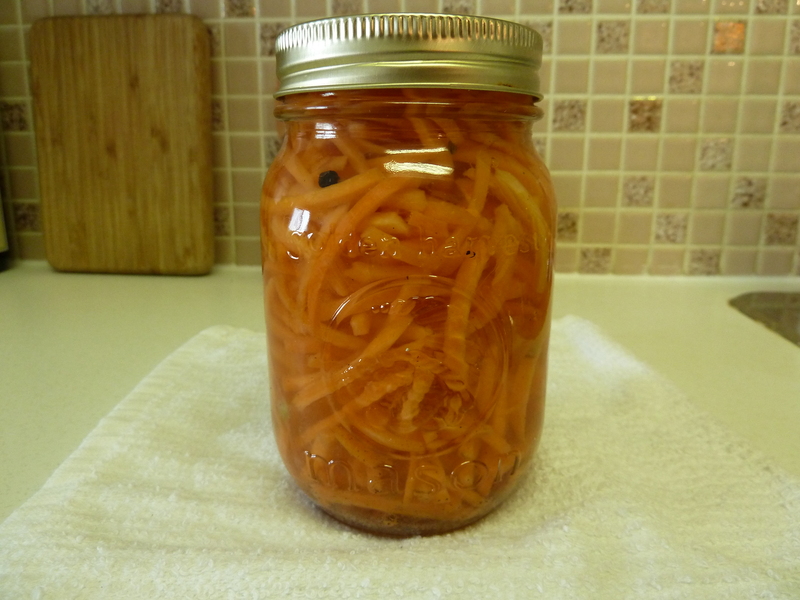 Look at my pickled carrot recipe this year. Too easy. Never fails and is delicious! Just tossed a knob of ginger into the freezer to give this a whirl. Thank you Supersu for the tip! Valerie! It’s been a long time. Foodie peeps meeting on the 30th. I’ll find a way to DM the details to you.